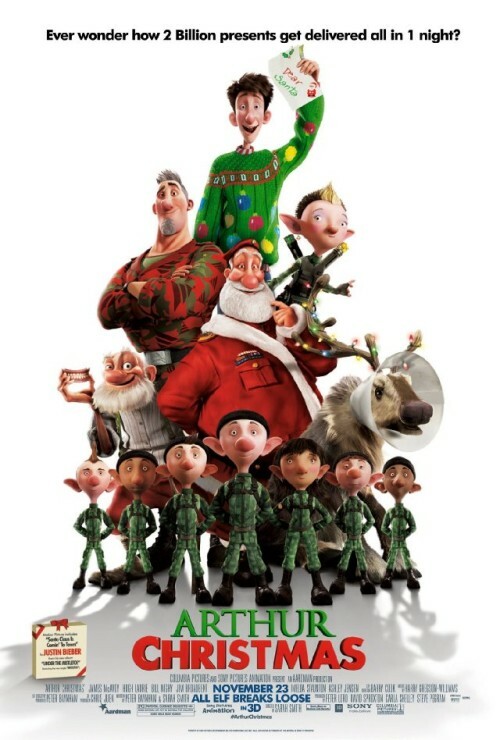 Arthur Christmas: Somehow retains its charm without becoming saccahrin sweet. I’ve always loved Aardman Animation’s sensibilities. The timing, the characters, the insight, and the ability to make the unbelievable grounded in some bizarre British reality. Nick Park’s Wallace and Grommit shorts were the start of my love, with occasional forays into thing like Creature Comforts. And frankly, I was a little concerned when Sony Pictures Animation merged with Aardman (I have yet to see the Dreamworks/Aardman production Flushed Away). Could they bridge that gap between the stop-motion animation that I loved so much, and allow it to be done in the computer? And the answer is that animation is animation no matter what the medium. And that means great animation still remains great. The look of the film is brilliantly art directed, and both aesthetically and technically stunning. I especially was fond of the look of the cloth, like Arthur’s sweater, the fur on the Reindeer, and, oddly enough, the realism of the sand on a desert island. Driven by Sony’s renderer of choice, Arnold, the look completely brings you into the world because it looks.. well…real. And I think that its the concept of placing very stylized characters into very realistic lighting situations that prevent us from falling down into that uncanny valley that Mars Needs Moms and Beowulf got stuck in. Another example of this would be Rango (using the veteren renderer, Pixar’s Renderman), and Monster House (using a very early version of Arnold). Directed and co-written by Sarah Smith (which I applaud… you rarely find a female director, and even less so a female animation director), Arthur Christmas taps into an amazing array of voice talent including James McAvoy, Hugh Laurie, Bill Nighy, and Jim Broadbent. Between Nighy’s performances at Davey Jones in the Pirates of the Caribbean films, Rattlesnake Jake in Rango, and Grandsanta in this, I think he may be my favorite voice actor at this moment (not that he’s a shlub at real acting). I would place this in the upper echelons of favorite Christmas films, ranking up there with the Rankin and Bass classics. But not toppling the best Christmas movie of all time — Die Hard.